This article is about the sword of folklore. For the newspaper, see An Claidheamh Soluis. For other uses, see Claíomh Solais (disambiguation). 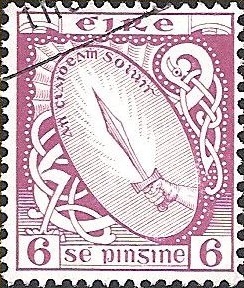 Definitive 6-pence stamp of Sword of Light, Ireland, 1922-3. Arched caption reads "An Claiḋeaṁ Soluis"
Claíomh Solais (reformed spelling), Claidheamh Soluis (pre-reform and Scottish Gaelic) (Irish pronunciation: [klˠiːvˠ ˈsˠɔl̪ˠəʃ]; an cloidheamh solais (variant spelling), rendered "Sword of Light", or "Shining Sword", or "a white glaive of light", is a trope object that appears in a number of Irish and Scottish Gaelic folktales. The sword has been regarded as a legacy to the god-slaying weapons of Irish mythology by certain scholars, such as T. F. O'Rahilly: the analogue in the Irish Mythological Cycle being Lugh's sling that felled Balor, and their counterparts in heroic cycles are many, including the popular hero Cúchulainn's supernatural spear Gae bulga and his shining sword Cruaidín Catutchenn. A group of Sword of Light tales bear close resemblance in plot structure and detail to the Arthurian tale of Arthur and Gorlagon. The folk tales featuring the claidheamh soluis typically compels the hero to perform (three) sets of tasks, aided by helpers, who may be a servant woman, "helpful animal companions", or some other supernatural being. The majority of are also bridal quests (or involve the winning of husbands in e.g., Maol a Chliobain). The sword's keeper is usually a giant (gruagach, fermór) or hag (cailleach), who oftentimes cannot be defeated except by some secret means. Thus the hero or helper may resort to the sword of light as the only effective weapon against this enemy. But often the sword is not enough, and the supernatural enemy has to be attacked on a single vulnerable spot on his body. The weak spot, moreover, may be an external soul concealed somewhere in the world at large (inside animals, etc. ), and in the case of "The Young King of Esaidh Ruadh", this soul is encased within a nested series of animals. The crucial secret to the hero's success is typically revealed by a woman, i.e., his would-be bride or the damsel in distress (the woman servant held captive by giants), etc. And even when the secret's revealant is an animal, she may in fact be a human transformed into beast (e.g. the great grey cat in "The Widow and her Daughters"). The secret about women is a theme borne in the title "The Shining Sword and the Knowledge of the Cause of the One Story about Women", considered an essential part of the original Irish story (I) according to G. L. Kittredge's stemma of texts,[a] even though "the woman" part is lacking (i.e. lost) in some variants, such as Kennedy's Fios Fath an aon Sceil ("perfect narrative of the unique story")[b][c] The "news of the death of Anshgayliacht", which occurs as a quest in another version is also a corruption of this. This reconstruction was made by G. L. Kittredge, who examines a groups of Sword of Light folktales cognate to Arthur and Gorlagon which he edited. A more familiar Arthurian tale which embeds the quest of "What is it that women most desire?" is The Wedding of Sir Gawain and Dame Ragnelle. Kittredge analyzes his group of Irish folktales (I) to consist of layers of elements: namely a frame story which binds the quest for the "cause of the one story about women" with The Werewolf's Tale type; to this is attached The Quest for the Sword of Light and a large interpolation he calls the Defence of the Child type tale. The Defence of the Child tale portion is in itself a composite according to Kittredge, composed of a Faithful Dog tale and what he calls a The Hand and the Child type tale. The latter tale has the motif of a grasping hand that seizes the victim, and gets cut off in some cases, akin to Grendel's arm in Beowulf. The Irish and Gaelic tales of this type exhibit the tale or motif of Skilful Companions, which was studied by Theodor Benfey and is known to be widespread all over the world. "The Weaver's Son and the Giant of the White Hill", (Curtin 1890, pp. 64–77). Here the "sword of sharpness". "Cud, Cad, and Micad", (Curtin 1894, pp. 198–222). "The Snow, Crow, and the Blood" (MacManus 1900, pp. 151–174). This tale closely parallels another collected by Hyde entitled "Mac Riġ Eireann (The King of Ireland's Son)", but in Hyde's version the hero's party obtains "the sword of the three edges" (cloiḋeaṁ na tri faoḃar). The publication of tales from the Highlands (Campbell 1860, Popular Tales of the West Highlands) predate the Irish tales becoming available in print. The magic sword sometimes appearing under variant names such as the "White Glave of Light" (Scottish Gaelic: an claidheamh geal soluis). The assertion has been made that Claidheamh Soluis is "a symbol of Ireland attributed in oral tradition to Cúchulainn" (Mackillop), although none of the tales listed above name Cuchulainn as protagonist. T. F. O'Rahilly only went as far as to suggests that the "sword of light" in folk tales was a vestige of divine weapons and heroic weapons, such as Cúchulainn's Cruaidín Catutchenn. This sword (aka "Socht's sword") is said to have "shone at night like a candle" according to a version of Echtrae Cormaic ("Adventures of Cormac mac Airt"). In O'Rahilly's schema, roughly speaking, the primeval divine weapon was a fiery and bright lightning weapon, most often conceived of as a throwing spear; in later traditions, the wielder would change from god to hero, and spear tended to be replaced by sword. From the heroic cycles, some prominent are Fergus Mac Roigh's sword Caladbolg and Mac Cecht's spear. But Caladbolg does not manifest as a blazing sword, and the latter which does emit fiery sparks is a spear, thus failing to fit the profile of a sword which shines. One example which does fit, is Cúchulainn's sword Cruaidín which was aforementioned. And the legacy of these mythological and heroic weapons survive in the "sword of light" in folklore. Unsurprisingly, some have seen parallels with this to Excalibur, due to some of the descriptions regarding how it shone. When Excalibur was first drawn, in the first battle testing King Arthur's sovereignty, its blade blinded his enemies. Thomas Malory writes: "thenne he drewe his swerd Excalibur, but it was so breyght in his enemyes eyen that it gaf light lyke thirty torchys." Other commentators have equated the Sword of Light to the Grail sword. In fiction, Nuada's sword is to referred to as the Claímh Solais, the sword of light (Book of Conquests (1978), The Silver Arm (1981), and Érinsaga (1985) by artist Jim Fitzpatrick), where it is described as a "rune-engraven" sword. According to Takerube [ja]'s reference book, Nuadha wore a shining sword called the Claimh Solais (phonetisized Klau-Solas)—fiery sword, sword of light. The Claimh Solais was a magic sword "engraven with spells", and reputedly an Undefeatable Sword such that once unsheathed, no one could escape its blows. It also was one of the Four Treasures of Erin brought from the mystical Isle of Findias in the North. '^ The "secret about women" being found also in the Latin G text (Arthur and Gorlagon) his assumption is it was also found in their common ancestor y. ^ Kennedy's title is identical to a phrase within O'Foharta's title, but Kennedy's translation is inaccurate according to Kittredge. ^ Cf. "Fios-fáh-an-oyn-scéil (the knowledge of the motive of the unique(?) tale)" given in Ó Ceocháin 1928, An Claiḋeaṁ Soluis: agus Fios-fáṫa-'n-aoin-scéil, summary in English, p. 281. ^ In Irish; this is another version of Curtin's " Sculloge's son from Muskerry"
^ Campbell 1860, I, 24, "The sword of light is common in Gaelic stories;.." etc. ^ Puhvel (1972), pp. 210, 214–215. ^ Ó hÓgáin (1991), p. 206. ^ Kittredge 1903: Kittredge refers to Morraha, ed. Larminie as I or the Irish folktale version of "the werewolf story" (Arthur and Gorlagon). ^ Puhvel 1972, p. 214 : "These are the 'swords of light' or 'glaives of light', usually in the possession of some giant or supernatural 'hag'". ^ Macalister, R.A.S. (2014) , Ancient Ireland: A Study in the Lessons of Archaeology and History, Routledge, p. 75 (original printing: London, Methuen & Co., Ltd., 1935 :"The 'sword of light'.. which made the giants of the fairytales invincible.. is always defeated in the end; the hero, the little man, always succeeds in stealing.. and cutting of its lawful owner's head". ^ O'Foharta (1897), pp. 477–92. ^ Larminie (1893), pp. 10–30. ^ Kittredge (1903), p. 163. ^ Kittredge 1903, pp. 163–7 and passim. ^ Kittredge (1903), p. 166. ^ Kittredge (1903), pp. 166, 168, 214. ^ Kittredge 1903, pp. 222–230 and seq. ^ An Irish text "Cod, Cead agus Mícead was given in An Seaḃac (1932), "Ḋá Scéal ó Ḋuiḃneaċaiḃ", Béaloideas Iml. 3, pp. 381–400. Where it is noted that the storyteller of Curtin's version was found and its Irish version transcribed by Seán Mac Giollarnáth. ^ in Hyde, Douglas (1890), Beside the Fire (Internet Archive), London: David Nutt , pp.18-47. Taken down from Seáġan O Cuineagáin (John Cunningham), village of Baile-an-phuill (Ballinphil), Co. Roscommon, half mile from Mayo. This tale is also closely summarized and analyzed for folk motives by Mackillop 1998, under "King of Ireland's Son"
^ Mackillop 1998, Dict. Celtic Mythol. ^ O'Rahilly 1946, EIHM, p. 68, "Cúchulainn possessed not only the spear of Bulga, but also a sword, known as in Cruaidín Catutchenn, which shone at night like a torch. In folk tales the lightning-sword has survived as "the sword of light" (an cloidheamh solais), possessed by a giant and won from him by a hero." ^ p. 218, in: Stokes, Whitley, ed. tr., Scél na Fír Flatha, Echtra Chormaic i Tír Tairngiri ocus Cert Claidib Chormaic (the Irish Ordeals, Cormac's Adventure in the Land of Promise, and the Decision as to Cormac's Sword ), in Irische Texte III, 1 (Leipzig 1891) pp. 183–229. ^ Puhvel (1972), p. 214. ^ Book I, 19, from The Works of Sir Thomas Malory, ed. Vinaver, Eugène, 3rd ed. Field, Rev. P. J. C. (1990). 3 vol. Oxford: Oxford University Press. ISBN 0-19-812344-2, ISBN 0-19-812345-0, ISBN 0-19-812346-9. (This is taken from the Winchester Manuscript). ^ Takerube's book lists Jim Fitzpatrick among its sources. Kennedy, Patrick, ed. (1866), Legendary Fictions of the Irish Celts, London: Macmillan and Co. This page was last edited on 22 April 2019, at 16:28 (UTC).